Are you aware that chess is one of the oldest and most played board game around the globe? It started off with 16 white playing pieces and 16 black ones, spread over a simple decent-sized checkered board consisting of 64 squares, but has evolved over the years to become available in different sizes, materials, shapes, quality, and price. Among the huge varieties of chess boards available today, wooden ones have emerged as a highly popular choice among buyers due to their durability and intricate designs. In fact, even those individuals who aren’t interested in the rules of playing this intellectual game tend to treasure one as a decorative piece or gift. A modern, beautifully crafted chess set is bound to tempt you and any onlookers into trying a hand at the game. Now, if you are on a quest to get your hands on the perfect wooden chess set, this article will serve as your perfect guide. How? Well, scroll on to find out! 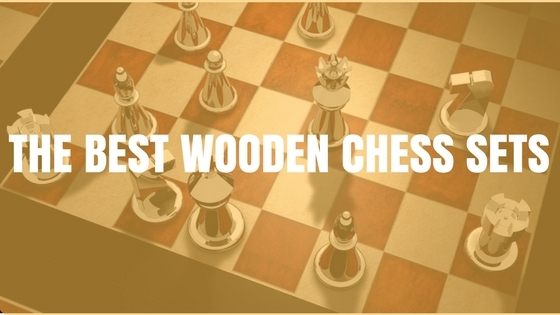 Don’t you agree that quality is key when buying a wooden chess set? After all, you can’t expect to make your purchase based on the appearance alone, right? So, if you wish to get your hands on top-notch quality, make sure that you purchase from a reputable manufacturer, such as House of Staunton, who is one of the best wooden chess set manufacturers in the world! It offers a large range of chess sets that differ in terms of size, price, style, and material but scream of quality all the same. Whether you are a chess player or collector, nothing can beat the feel of a finely crafted piece by this manufacturer. Besides, each of their wooden chess sets is crafted skillfully using high grade woods and promises to sustain the endurance of many rough games. However, since there are countless varieties of wooden chess boards prevailing in the market, picking from the lot can be quite frustrating. In order to facilitate your decision making process, we have reviewed some of the best ones. Come, make your selection! If you are looking for a large wooden chess set, the 6’ Classic series chess set, box and board combination is a superb option. The board measures 24 x 24 inches and has been handcrafted using golden rosewood and natural boxwood. All in all, there are a total of 34 playing pieces which includes two additional queens. The kings have a height of 6 inches and a base diameter of 2.25 inches, brilliant size, right? Moreover, each of the chess pieces not only flaunts a beautiful finish but are also heavily weighed down with luxurious billiard cloth base pads. It is absolutely amazing how such exceptionally well-crafted chessmen are put for sale with a reasonable price tag. Certainly, the manufacturers have been thoughtful enough to create an attractive and high-quality chess set for those who can’t afford luxury sets. The 0.5 inch thick chessboard boasts a satin finish and features Montgoy Palisander and Bird’s Eye Maple squares that make up the dark and light checkered pattern. 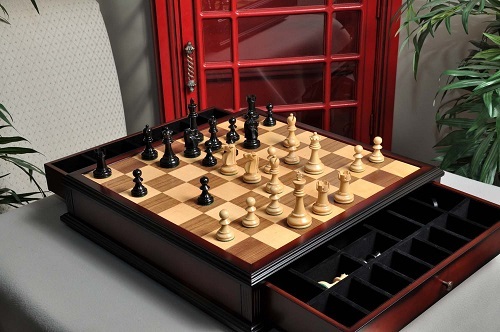 Besides, the game comes with the largest chess box available, to easily accommodate large figurine chessmen. It is also equipped with two compartments, each with a separate lock and key. Are you on a tight budget? Worry not! The Ambassador European chess board has been handcrafted along an Eastern Europe Etno theme in Poland and costs very reasonable despite its attractive design and large size. In fact, the size and color proportions are good enough to help players plan their move with more clarity. The board, measuring 21.65”W x 1.18”H x 21.65”D, has a solid construction of beech and birch wood whereas the pieces are structured using sycamore and hornbeam wood. Although the woods used are among the toughest, the overall feel of the felt base chessmen is lightweight and very much preferred by many players. Furthermore, each pawn, queen, and king exhibits an impressive size of 2.28 inches, 3.66 inches, and 4.5 inches respectively. The folding chess board also provides a felt lined compartment for the safe storage of all the chess pieces. Furthermore, each slot is designed to perfectly accommodate the different shapes of each chessman without causing damage due to overlapping. Moreover, the border of the set is adorned by algebraic coordinates to help beginners conveniently find specific squares for moving their playing piece into. This also adds to the overall aesthetic appeal of the chess set. Looking for the perfect magnetized chess set? Well then, get your hands on the Agirlgle International Chess Set which comes with a folding wooden chess board and classic handmade standard pieces! What’s better is that the playing pieces are made of environmental zine-alloy and therefore have a fair weight and keep away rust too. The wooden chessboard measures 11.4 x 11.2 inches, with a width of 1 inch. It is also equipped with a metal lock catch for securing the pieces inside the felt lining space when not in use. The chessmen have a good enough height for convenient playing whenever you are on the move, with the King showing off a height of 2.6 inches. The design overall is quite exquisite and easy to carry. In fact, it can serve as a great décor piece or a gift on any occasion. Moreover, since the chess set is portable, it makes a great travel companion. So, practice all those moves even when you are on the go! One set that comes in limited quantities and is quite popular due to its quality and features is the SouvNear wood chess set. This is a handmade magnificent magnetic chess board which is foldable too. Besides, Indian Rosewood, which is one of the prettiest natural grain hardwood and is more commonly known as Sheesham, has been used to craft the chess set. When opened, the board spreads to a size of 10.5 inch x 10.5 inch. An amazing travel size for chess lovers, don’t you agree? Moreover, since the board and playing pieces are magnetized, you can make a game last for days when you are playing at home, and it is guaranteed that the pieces won’t bump into each other when you are planning your next move during a ride. There are 34 chess pieces in total with the King’s height being a decent 2.25 inches. All of the chessmen are crafted logically to match the size of the chessboard that consists of 1.25 x 1.25 inch squares. Moreover, the storage compartment is finely done with quality felt lining with designated space for each piece within the board. This prevents rattling when you carry the chess set around and ensures that no chessman gets lost. Do you know about the strongest and fairly pretty magnetic travel chess set available? It is the foldable wooden Standard Travel International Chess Game board that comes with brilliantly crafted magnetic playing pieces. This beautiful board and the pieces have been handcrafted using golden rosewood and maple wood. When unfolded, the board is 12 x 12 inches wide and it also features special slots with foam inserts where you can safely tuck away all the chessmen when not playing. This means that there will be no rattling or pieces getting lost whenever you are on the move. Furthermore, the playing pieces stand at a good size too, with the King’s height being 2.5 inches. Perfect to occupy a 1.25 inch square, right? Being magnetic, the best thing about this stylish board is that it allows you to play your favorite game while on an airplane, train or even when you are enjoying a boat ride. The chessmen are built to remain rooted on their respective squares unless you move them yourself. This means that none will topple over during a slightly bumpy ride. Moreover, it is compact and easy to carry. Using ebonized and natural boxwood, the Reykjavik II Series Tournament Chess Set and Tiroir combination has been diligently hand carved to produce good-sized chess pieces that are weighted with luxurious billiard cloth base pads and flaunt a beautiful look overall. For such exceptionally well-made wooden chessmen, the set carries a very reasonable price tag. 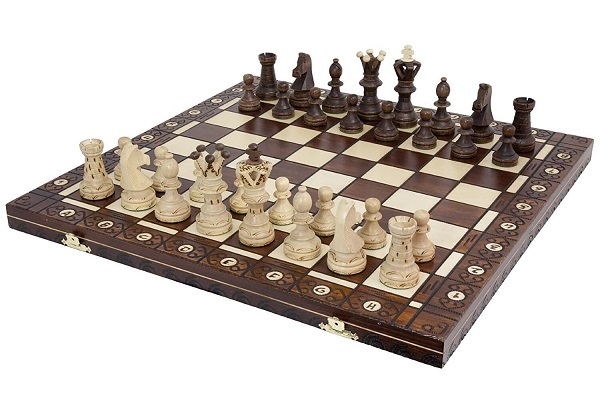 This one can certainly be classified as one of the most durable and attractive chess sets available. 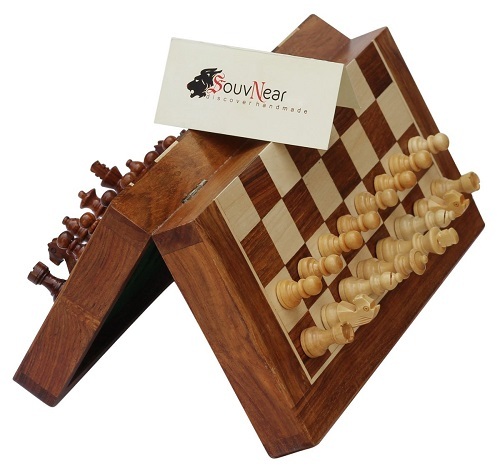 Also, inspired by the chess set used in the legendary 1972 World Chess Championship, this wooden beauty comes as a full tournament sized set which measures 22.5 x 22.5 x 4.5 inches with 2.25 inch Walnut (dark) and Maple (light) squares, a cherry frame and a satin finish overall. It has been constructed to withstand all the rigors pertaining to several years of use while maintaining its elegance at the same time. In total, the set consists of 24 playing pieces, including two additional queens. All of these come housed securely inside a classical Tiroir display chessboard that is equipped with two drawers. The King stands at an impressive height of 3.75 inches with a 1.7 inch diameter base. Moreover, the drawers contain individual slots for storing each piece and preventing damage by the chessmen tumbling over each other. Are you a fan of the medieval times? 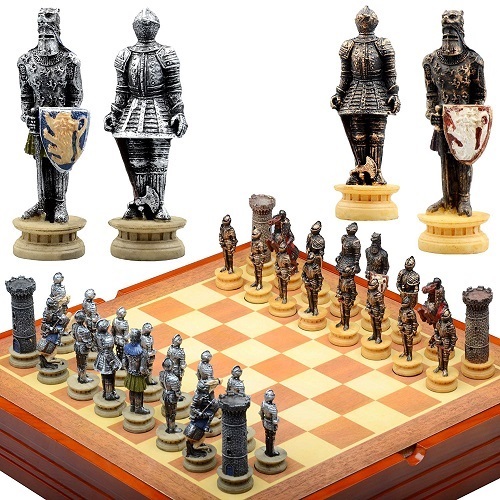 If yes, then you are surely going to love the Medieval Knight wooden Chess set which invokes the aesthetics of the nobility famous during the 14th century. Everything from the playing board to each of the chess pieces displays exquisite workmanship with clear patterns. 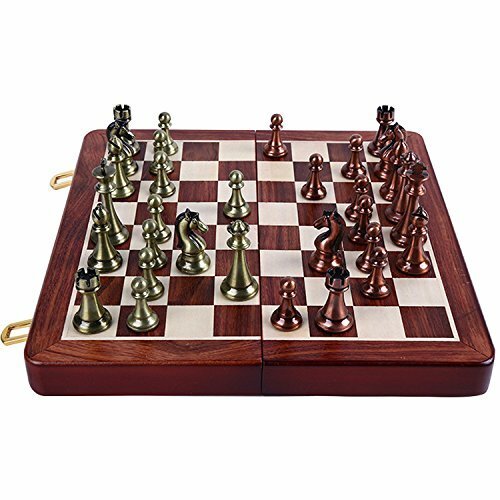 The chess board covers an area of 14.5 x 14.5 inches and is done up with walnut and maple colored squares to provide a striking contrast with the antique styled chessmen that have been colored in a combination of brown and ivory. Moreover, all the chess pieces are crafted out of resin and are sized accordingly to fit the squares. Besides, the distinctive design of each chessman provides a convenient playing experience. The medieval knight chess set is bound to arouse interest of both youngsters and elderly alike to engage in an epic battle. Furthermore, the set can also serve as a sophisticated decor in your home. The playing pieces can be tucked for safety in their foamed compartment when not in use. In a nutshell, the design, craftsmanship and excellent quality of this wooden chess set is highly commendable. Does the thought of spending endless hours playing three evergreen games of all times sound appealing? Well, I don’t know about you but in my case, definitely, yes! 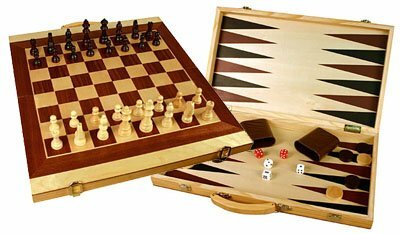 So pick up the 20 inches wide wooden 3-in-1 set and set off with playing chess, checkers, or backgammon as much as you want. Crafted neatly with camphor wood, the board folds conveniently and is equipped with a carrying handle for easy portability. When spread open, the board measures 15.5 x 15.5 inches with a depth of 1 inch. The wooden set includes playing pieces of all three games which includes Three Kings with a height of 3 inches each along with 29 chessmen, two dice cups and 5 dice for backgammon. An instructions manual is also included for all those who want to learn whichever game is new to them. The wooden board forms a compartment like space when folded in half, where you can store all the playing pieces in order to prevent them from getting misplaced. This makes a perfect gift for the entire family on any occasion! Moreover, with a checkered pattern on one side and a backgammon surface on the other, this set is an awesome option to take along while vacationing or going out on camping trips. If you are really into this game, you must be aware about Garry Kasparov being the world chess champion. This is whom this wooden chess set is named after as the star himself was deeply involved in the designing phase. The chessmen have been given a fresh new look along with a premium finish to ensure an amazing playing experience. Moreover the presence of an instructions booklet allows players to go over any game rules that they might have forgotten. 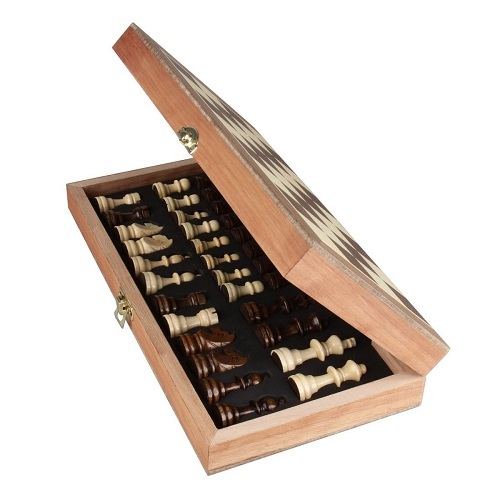 Furthermore, available in a compact travel size, this 14 x 14 inch wooden chess set comes with sturdy, hand carved wood chess pieces that not only fits perfectly in the 1.5 inch squares but also provides clarity to plan your next move without difficulty. The King itself exhibits a decent height of 2.25 inches. Overall, this is a pretty affordable chess set for those who are on a budget and is a great investment for new players. Wooden chess sets are available in so many different colors and textures, making them richer in appearance and more solid in durability. With so many attractive wooden chess sets flooding the market today, it is only natural for anyone to get confused when deciding which one to get their hands on. A good tip to ease this somewhat frustrating process is to narrow down the options by identifying the purpose of your purchase. Remember, you can select a wooden chess set as an addition to your existing home or office décor, for gifting a loved one, as a collector’s item, or merely for playing the game. The premium quality wooden chess sets outlined above will surely help you in your quest to find the best one. Each set is carved with the best craftsmanship possible and suits different budgets without going too steep into any pocket. So what are you waiting for? Make your pick right now and let your beautiful choice be an eye-candy for all!